Soundbites. I am very happy to have been part of the 1st Waterloo Foundation Meeting on the Idiopathic Focal Epilepsies of Childhood, which took place at King’s College in London on September 29th, 2012. This meeting was exclusively dedicated to everything rolandic. While the 10th European Epilepsy Congress is just getting started, we thought that we could provide you with a few soundbites from this meeting. And — by the way — rolandic epilepsy is far from being explained. Rulandus vs. Rolando. Rolandic Epilepsy (RE) is probably the most common epilepsy in children. Interestingly, the jury is still out on where this epilepsy got its name from. On the one hand, Martinus Rolandus already described many features of this epilepsy in the 16th century. On the other hand, rolandic seizures are inadvertently linked to the brain region surrounding the rolandic fissure, which has been studied in detailed by Luigi Rolando. Both origins, however, underline different aspects of the disease, the clinical manifestation (Rulandus) and the neuroanatomical region that gives rise to the signature EEG pattern (Rolando). Either way, the following citations from the meeting should highlight different aspects of the complicated genetics of rolandic epilepsy. “Maybe we shouldn’t talk about heritability anymore.” Talking about heritability in rolandic epilepsy is frustrating. To make a long story short: while there is good evidence for some genetic contribution to the EEG trait of centrotemporal spikes, there is no data out there that the seizures have a genetic contribution. Sib studies do not have sufficient power and the few twins reported in the literature are consistently discordant, i.e. only one twin is affected. Not a good starting point for genetics, you might think. However, modern genetic research has moved past this controversy. Heritability as observed and defined through twin studies carries less weight and is no longer a prerequisite for molecular genetics. In fact, some studies have suggested that less heritability might be better for gene discovery. “If you gave me money to genome-sequence five patients with RE, I wouldn’t take it.” I would use the money for something else probably, since the full genome sequence in only five individuals will tell us very little about the disease itself. It might be the method of choice if we assume that all five individuals have mutations in the same gene, but what is the chance? There is sometimes the misconception that going “deeper” into your genome will only make things clearer. This is not true. There is a flood of genetic variants with probably several thousands of genetic variants unique to every individual. Telling which of these variants is causative in a small group of patients is only possible if there is clear-cut monogenic inheritance. If this were the case for RE, we would already know it. Higgs vs. Clarke. Theoretical physics vs. Science Fiction. 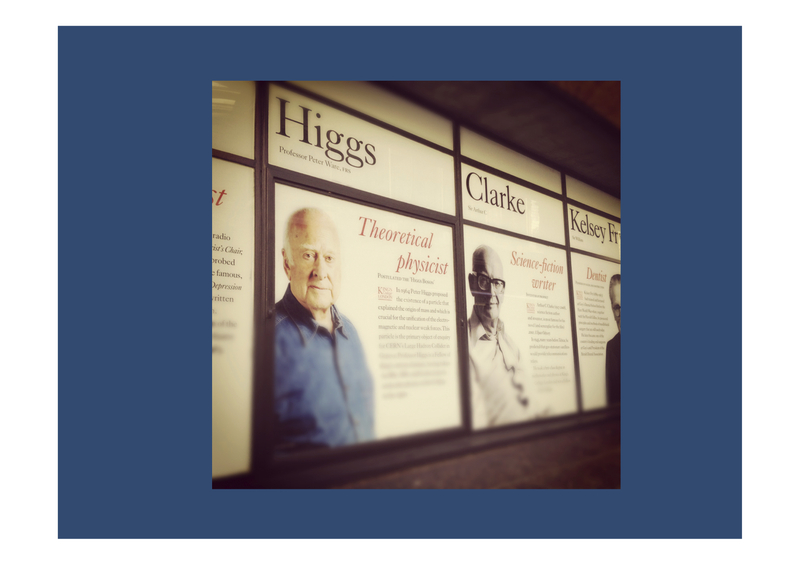 Peter Higgs is the name giver of the Higgs Boson, Arthur C. Clarke the author of Space Odyssey 2001. This picture was taken at King’s College, London. Epilepsy genetics is sometimes stuck between theories that are difficult to prove and science fiction. “What about MDGA2?” I used MDGA2 as an example of a gene that is a potential susceptibility gene for Idiopathic Focal Epilepsies, which faces all the insecurities of the genomic era. MDGA2 was found to be partially deleted in a proband with idiopathic focal epilepsy. Deletions of this gene were previously described in autism. However, there are smaller deletions and duplications described in controls in the Toronto Database of Genomic Variants (TGV). However, these variants may affect genes that are differentially spliced, and some variants in TGV may be false positives. When performing a very conservative sweep, this gene would not be considered a candidate, given the findings in controls, but we might do injustice to a potential candidate gene due to imprecise control data. The Double Helix and King’s College. King’s College and the discovery of the Double Helix is a story in itself. King’s College was the workplace of Maurice Wilkins and Rosalind Franklin. Wilkins received the Nobel Prize alongside Watson and Crick, but hardly anybody remembers this. He is the Third Man of the Double Helix. Rosalind Franklin, however, will always be remembered as the person who produced the most valuable hint with her X-ray crystallography images, but who did not receive the appropriate acknowledgement. There are detailed investigations and biographies regarding the complex interactions between Watson, Crick, Wilkins and Franklin surrounding the question whether data was used without the appropriate acknowledgement or not. Either way, the story of Rosalind Franklin and King’s College points out that competition is a major issue in science. It is also a romantic look backwards at a time when science was still a one-man/woman-show. At least in the genetics field, ground rules have changed since then. The lonely genius scientist has been replaced by the homo consortius, the network researcher. And hopefully, elbows have been replaced by some social awareness. This entry was posted in 2012, EuroEPINOMICS, Ideas, Opinion and tagged Arthur C. Clarke, DNA, Double Helix, Higgs, Rolandic Epilepsy, Rosalind Franklin. Bookmark the permalink.